The CY74FCT2244T is an octal Buffer and Line Driver that includes on-chip 25- terminating resistors at each of the outputs to minimize noise resulting from reflections or standing waves in high-performance applications. The on-chip resistors reduce overall board space and component count. Designed to be employed as a memory address driver, Clock Driver and bus-oriented transmitter/receiver, this device provides speed and drive capabilities commensurate with its fastest bipolar Logic counterparts, while reducing power dissipation. The input and output voltage levels allow direct Interface with TTL, NMOS, and CMOS devices, without the need for external components. This is one package pinout of CY74FCT2244T,If you need more pinouts please download CY74FCT2244T's pdf datasheet. 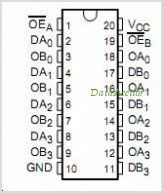 CY74FCT2244T circuits will be updated soon..., now you can download the pdf datasheet to check the circuits!